/ Philippines / 10/21/2017: Go Forward! 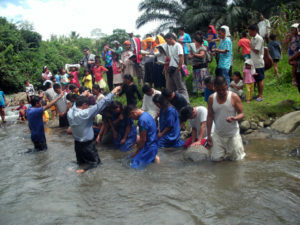 It took years, but a Baptist family accepts the Sabbath and starts a branch Sabbath School in The Philippines. “Someone must fulfill the commission of Christ; someone must carry on the work which He began to do on earth; and the church has been given this privilege. . . . Those who have been engaged in this Christian help work have been doing what the Lord desires to have done, and He has accepted their labors. That which has been done in this line is a work which every Seventh-day Adventist should heartily sympathize with and indorse, and take hold of earnestly.” Testimonies, vol. 6, 295. I am thankful to God for the Christian help that Mission Projects International provides for the evangelistic efforts and church building projects here in the South Cotabato area of Mindanao Island in the Philippines. As I look back through the years since Mission Projects International began helping my work here, my heart feels very grateful. We are so blessed that God sent this ministry to us! I am really, really thankful to the donors who have helped the work of the Lord. Through your support, my brothers and sisters in Christ, God’s work has been widening and progressing in South Cotabato. By God’s help, I met a man named Elezer from the Hope Baptist Church. 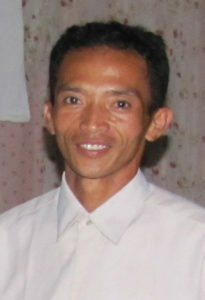 Elezer is a very friendly, talkative man and easy to converse with. We talked about his beliefs as a Hope Baptist and started comparing the different doctrines between the Seventh-day Adventist faith and the Hope Baptist teachings. Through God’s grace and by His Holy Spirit, Elezer understood the Seventh-day Adventist doctrines and soon introduced me to the other members of his church family. The Holy Spirit piqued their interest so that soon we began having Bible studies together. Years passed while we continued studying the Bible with these Christians. Finally, they began observing the seventh-day Sabbath. Several months ago, they established a branch Sabbath School in their own makeshift building. The roof is a tarp and the benches and even the posts of the building are made of bamboo. The construction is simple, yet every Sabbath the group comes together, happy to be worshipping God who created the heavens and the earth. Please pray for these people and their little congregation that their group will continue to grow and that someday their tarp roof will be replaced with a sturdy steel roof that will last. As for me and the other workers here, God’s instructions are clear. We continue to press on into new fields of labor, praying for a rich harvest! “When we open up the work in one field, and gather out a company, we consecrate them to God and then draw them to unite with us in building a humble house of worship. Then when the church is finished, and dedicated to the Master, we pass on to other fields. Distinct and plain the word has come to us, ‘Go forward,’ and just as soon as the warning message has been given in one place, and men and women raised up to continue the work there, we pass to the unworked parts of the Lord’s vineyard.” Evangelism, 381. With your help and God’s, we will continue to go forward until Jesus comes! Pray for the Holy Spirit to lead Temtem and the other gospel workers to honest souls who are open to God’s truth. Pray for the new congregation established by the former Baptist believers, that they will stay strong in the faith and that they will be able to build a proper church structure soon.